Starting to feel just a little of the Yule spirit yet? Here's a photo of a holly bush with berries to help. On Friday 13 I went for a walk in a graveyard, as you do and took this picture. My list of resolutions for this year included going to Tower Hamlet's Cemetery - the only one of the Magnificent Seven Victorian cemeteries that I hadn't already seen. In fact, it also put me a step closer towards ticking off another thing on my list - visiting three peaceful wildlife havens within London - because as well as being a cemetery, it is a woodland nature reserve. 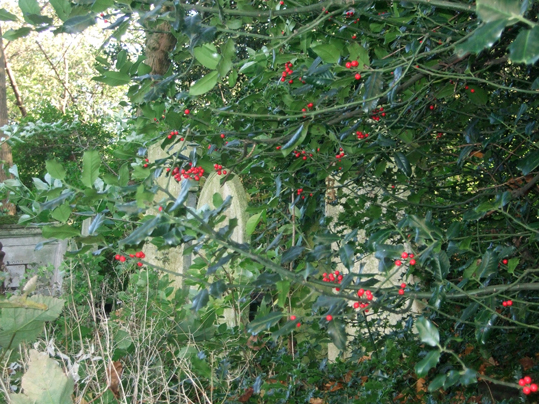 The berries on this holly tree among the tombs were bright red and very seasonal. Although the berries are poisonous to humans, plenty of birds eat them. Mistle thrushes will often stake a claim to a holly tree full of berries and guard it throughout the winter to stop other birds stealing their store. However, the birds' favourite food is mistletoe berries, after which it is named.